K-Nine Dobermans raises quality family companions whose temperaments are of the utmost importance. We raise our doberman puppies indoors, where they are a part of our family. All puppies are either Champion-sired or out of Champion lines, with emphasis on conformation and ability. Chu Chu is American Canadian Internation Champion sired. All puppies come with full AKC doberman pinscher puppy registration. We ship nationwide, weather permitting. Photos of doberman puppies for sale, videos, and parent’s pedigrees are on my website. Call toll-free. 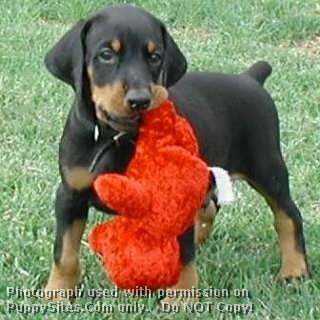 I have been a doberman breeder for 13 years.